While the time honored adage of “everything in moderation” typically applies, when it comes to beautiful literature (and dessert! ), the more the better! I truly don’t think you can ever have too many fabulous books. Not only do they enrich a home, but they are a great conversation piece with guests. As soon as I had my own apartment after college, I began collecting coffee table books, seeking out colorful and ornate covers, color coding spines, and curating a library of my favorites. I remember the very first coffee table book that I purchased – The Audrey Hepburn Treasures. I found it while exploring the gift gallery at Barney’s, and spotted it prouldy perched atop a stack of interior design books. There was something about Audrey’s playful smile on the cover and the pastel pink binding, that I knew I had to have it. Over the years, and even as recent as our move this summer, I have continued to collect books and expand my collection. Why do I love these books so much? Where do I begin! They offer exquisite photography, endless inspiration, interesting stories, and of course an element of chicness to any room. I tend to gravitate towards interior design an entertaining books, however I think it’s important to diversify one’s content, and so I also have some gorgeous fashion, travel, and even nature books mixed in. As you create your own collection, use your passion (fashion, table setting, etc.) as the foundation for the collection, and then incorporate other topics so you too can have a nice mix. Also, be sure to check out my post on how to style your bookshelves. Styling shelves sounds simple and easy enough, but it’s really an art, as you want to strike the perfect balance between height and color, and form and function. And so, here are my top five favorite coffee table books that I adore and think you will too. Enjoy! An ode to the most coveted color combination, this book will steal your heart. It’s filled with interior design and table setting inspiration, and the perfect addition to your library or even a gift for a friend. Trust me, you need this book! Read the title and need I say more? It’s what ever chic gal needs, and the simple yet bold cover – a white book jacket with scarlet red lettering – adds an air of sophistication to any bookshelf. My best friend gave this to me for my birthday a few years ago, and it has since been my absolutely favorite. 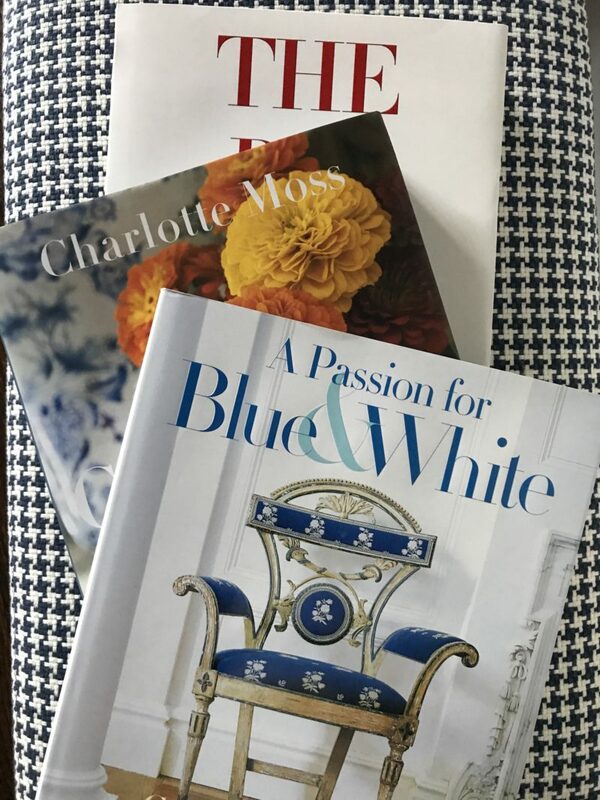 Charlotte Moss knows a thing or two about table setting and interior design, and this book is a testament to her talents. The cover itself – blue and white ginger jars filled with striking orange and yellow blooms – is perfection and truly sets the tone for this special book. I love all of Veranda’s books for their elegant aesthetic and shelf presence. There is something about this book in particular though with its cover featuring lush emerald hued greenery that always captures my attention.